(Newser) – In the summer of 2015, Allegiant Air had a number of in-flight breakdowns—on one day in particular, there were five such problems. Between the beginning of 2016 and the end of October 2017, a 60 Minutes investigation uncovered more than 100 serious mechanical incidents the airline experienced: from hydraulic leaks and air pressure loss in the cabin to rapid descents, aborted takeoffs, and more—including 60 unscheduled landings. The airline has just 99 planes, yet experienced 25 engine failures or malfunctions in two years, and its planes are three and a half times more likely than those of other carriers to experience "serious in-flight mechanical failures," per the report. 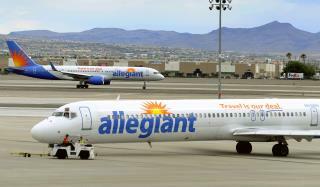 But Allegiant Air, a budget carrier based in Las Vegas, is one of the most profitable airlines in the US, even if most customers are unaware of those problems. Allegiant Air..We guarantee you that you will make it to the scene of the crash 15 minutes before the paramedics do. Allegiant Air ... when you're flying home to Hospice care.